Coleraine's Eoin Bradley scored a hat-trick against Carrick Rangers in the Irish Cup. Oran Kearney was delighted with his side’s quickfire blitz of Carrick Rangers last week, but he wants to see it more often. The Bannsiders killed off the fifth round Irish Cup tie at The Showgrounds inside 25 minutes last Saturday. And Kearney is demanding his players get out of the blocks so quickly every week. “Confidence is high and you could see that in our play after we scored the early goals,” he said. “But I said to the lads we should be coming out ready to play like that from the off. “It’s very hard to get up to speed in a game if you don’t start well. “We put a lot of work in to make sure we get out of the blocks well. It marked a good seven days for the Bannsiders with a hat-trick of wins and the goals flowing again thanks to new signing Eoin Bradley and Jordan Allan, who has committed his immediate future to the club. But Kearney’s striking options are boosted further with the return to fitness of James McLaughlin and Portadown old boy Gary Twigg. “The last two games show why it was so important to get someone of Eoin’s stature and quality back here,” he said. “It has been a really good week for him and Jordan, but the team as a whole has been excellent. “December was a tough month with key players missing, but now to have James back and also Gary back it’s a huge boost to all of us. 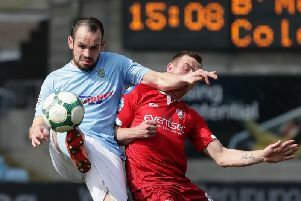 Kearney is hoping his side can continue their recent run of good form when Portadown visit The Showgrounds on Saturday. Key to any success on the road for Portadown will be showing similar character to that which helped Currie’s depleted squad see off Larne in the Irish Cup - with a debut goal for Adam Foley an added boost. “The reality is time stands against us given the need to claw back points,” said Currie. “The Larne win was not the most impressive football but I was really proud of the way the players managed to dig in and produce the display needed on the day. “We will need those positive qualities moving forward and it was also important for signings like Jordan Lyttle and Tiarnan Mulvenna to build up minutes, plus Adam can take confidence from his goal and performance. The Ports face Coleraine with Robert Garrett and Garry Breen serving suspensions - plus injury concerns over Mark McAllister, Keith O’Hara and Sean Mackle.